Muzo Noise Cancellation Reviews - Is it a Scam or Legit? 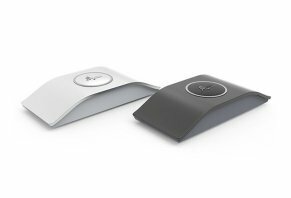 Using Billion Sound Technology (BST), the Muzo smart acoustic device attaches to any smooth surface and generates dynamic, realistic sounds, while promising to cancel vibration and outside noise. Position Muzo toward the noise and reposition if needed. Gently press the large button on the surface to select your ambient noise (or, use the noise-canceling technology by itself). Rotate the button to adjust soundtrack volume. Together, the company tells us that Muzo’s noise-blocking technology can create a “personal zone creator” that can work as an alternative to sleep aids and costly sound machines. Muzo sure sounds cool, but is it worth the money? Is it even a feasible concept? We didn’t test Muzo firsthand, but we learned a lot of information during our research that could help you answer this important question. We’ll cover what we here. 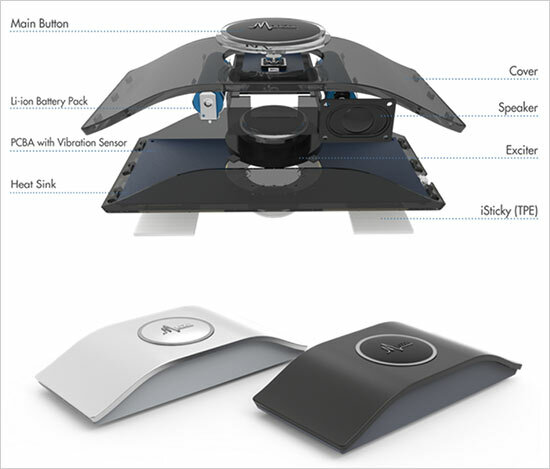 How Does Muzo’s Anti-Vibration Technology Work? Whether on TV, in a picture, or in person, most of us have seen a loudspeaker before. At their most basic, these devices use a magnet, a coil that conducts electricity, and thin fabric, plastic, or paper cone (also called a diaphragm), that work together to convert mechanical vibrations into sound. Although each of these parts is essential, the diaphragm (the part that vibrates wildly when the cover is removed) is what physically converts these vibrations into sounds. Comparatively, the exciter technology used in Muzo essentially acts as a loudspeaker without the diaphragm. But if this is the case, then how does it cancel—and generate—sound? Instead of a cone, an exciter “speaker” is attached upside down to a rigid surface. As the entire structure of speaker vibrates up and down, it applies force to the surface, which then acts as a diaphragm to convert these vibrations into sounds. 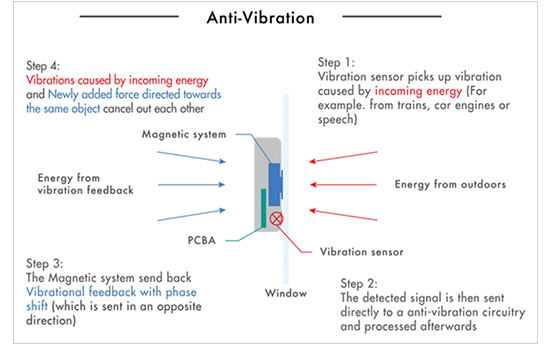 But instead of emitting sound from a single point like a speaker, Muzo tells us it sends these vibrations to whatever it's attached to, whether a desk, a wall, or a window. Specifically, Muzo tells us sound will generate from “every particle of the attached surface” and deliver excellent sound simulation and vivid quality. With these basics in mind, let’s take a look at some of Muzo’s other details. What Other Technologies Does the Muzo Noise Blocker Feature? The Muzo device is compact and portable, featuring a built-in Li-ion battery that can operate for up to 20 hours—and when the time comes to recharge (using the included micro-USB cable), an indicator light will blink to let you know. On the back, Muzo uses a non-toxic, environmentally friendly TPE (thermoplastic elastomer) that allows you to stick, reposition, and remove the device as often as you like. Manually changing modes and adjusting volume is handled via the main exterior button. Despite its compactness, Muzo claims to be jam-packed with a variety of cutting edge technologies. For example, it utilizes a complicated algorithm and a powerful processor to compute a vast amount of signal data, while using a circuit board assembly and a vibration sensor to balance the amount of feedback provided by the NEO magnet system. Together with the two built-in speakers and the company’s Billionsound Technology (BST), we're told Muzo can generate nearly 1,000 “dynamic, realistic” sound scenes that can drown out intrusive noises, or even help ensure your privacy. Serenity Mode: Uses anti-vibration to to drown out exterior noises. Sleep Mode: After setting the alarm, Muzo will help you fall asleep and will then generate sound waves when it's time to wake up, purportedly to improve the quality of your slumber. Secret Mode: If you're out in public and want to ensure your conversation isn't overheard by others, Muzo can use its sound masking feature to protect your privacy. Inside the Muzo app, which connects to the device via Bluetooth LE, you’ll be able to choose between each these modes, adjust sound levels and noise monitoring, choose from 12 realistic soundscapes and mix them according to your preference, analyze your sleep, set auto-off timers, and adjust the protection range for Secret Mode. In their crowdfunding campaign, one of Muzo’s stretch goals was to include RGB LEDs that could provide mood lighting selection and “decorate your room with color,” although we didn’t encounter any images or videos of these lights in action. How much will you pay for Muzo's unique approach to noise cancellation? How Much Does Muzo Cost? What’s the Release Date? After placing your order, Muzo will send you a link to a survey where you can choose your color and enter your shipping details. All U.S. orders will pay $10 S&H and $15 for the rest of the world. There weren’t any refund or warranty details listed on the Muzo website, so we reached out to the company to learn more. We’ll be sure to update this article as soon as a response is received. Given the fact that most Muzo devices hadn’t shipped at the time of our research, could we learn anything from customer feedback? Muzo launched through a 2016 Kickstarter campaign where nearly 3,000 backers contributed more than $530K. The company also pulled in more than $1.5 million in pledges on a subsequent Indiegogo campaign. No updates were listed on Indiegogo (despite dozens of requests from backers), and updates on Kickstarter were only available to backers. While it technically doesn't exist in the hands of customers yet, how does Muzo's technology compare to traditional noise canceling methods? And what are customers saying about it? Muzo vs. Noise Canceling Headphones: Is This Possible? We won’t go into unnecessary detail here, but traditional noise canceling headphones work using a tiny microphone to pick up ambient noise. Then, built-in circuitry creates an ‘anti-wave,’ so-to-speak. In other words, this outgoing wave is the exact opposite of the incoming sound wave, which is rendered inert before having the opportunity to vibrate your eardrum. The anti-wave basically acts as an invisible wall that prevents sound from being received by the user. On the other hand, while we explained the technological details earlier, Muzo claims to cancel noise using anti-vibration technology that counteracts vibrations on a specific surface to which it’s attached. Instead of generating ‘anti-waves,’ it generates anti-vibrations. The HighYa team isn’t staffed by electrical engineers or physicists, although a lot of consumers are expressing skepticism that Muzo will work as advertised. Why? In a nutshell, because sound is three-dimensional. With noise-canceling headphones, their microphone can intercept sounds at a very specific point (your ear), regardless of where in this three-dimensional space the sound was generated. However, to accomplish the same in an open room, many consumers claim Muzo would need dozens of microphones and multiple vibration-canceling devices to negate the sound coming from all directions. And even if this was the case, they claim that Muzo still couldn’t selectively choose which sounds to eliminate. This way (assuming it’s possible), Muzo would basically make everything in the room go silent—including your voice, the voice of anyone else in the room, the television, and so forth. For a general rundown of this skepticism, we’d recommend checking out this Reddit thread. For a great summarization of what we just discussed, be sure to read mad_scientist_kyouma’s quick response. Are There Other Products Like Muzo? If you’re looking for a pair of traditional noise canceling headphones, you have hundreds of options, including those from worldwide brands like Bose, Sony, Sennheiser, AKG, Bang & Olufson, and Audio-Technica. We even wrote about the Kokoon Headphones recently. In general, you’ll find that the bulk of over-the-ear options are priced somewhere between $100 and $300, while in-ear options can be purchased from overseas manufacturers for as little as $20. As far as Muzo specifically? We didn’t encounter anything exactly like it currently on the marketplace during our research, which could be because it's a revolutionary concept—or that it violates the laws of physics and isn’t possible. Reading through the Reddit thread above, one commenter noted that Muzo advertises a very similar concept as Sono, which was widely promoted in 2013 and then largely fell off the face of the earth. The company behind Muzo is Celestial Tribe, a San Francisco-based startup with a dense background in mathematics, electronic engineering, and information engineering. No team members are listed on their site or either of their crowdfunding campaigns. Is It Time for You to Make a Pledge to Muzo? Again, we’re not physics majors here at HighYa (although we did reach out to some regarding feedback about Muzo’s feasibility) and we didn’t test the device firsthand. But based on many of the reservations expressed by online consumers—along with the fact that other similar projects have fizzled out—we’re cautiously optimistic about the noise-canceling device. Fortunately, as long as they don’t experience any delays, we should start hearing about real-world customer reviews very soon, which is one of the best ways to make an informed purchase. In the meantime, we sent Celestial Tribe a few questions, including evidence for their claims, performance expectations, technical data (recharge times, number of recharges for a battery), and refund/warranty information. We’ll be sure to update this article as soon as a response is received. In the interim, don’t leave us hanging. Tell us all about your Muzo experience by writing a review below! I bought one on Kickstarter. From the external box seems a real stuff, nice box. But it's the only nice thing they did. The speaker got a terrible sound; it's only good to create noisy waves or wind sounds, nothing better than a free app can easily do. About the supposed "noise reduction" effect, absolutely nothing. I wrote back an email and asking maybe there's something I have to do or something I did't understood. Nobody never answered. After a while, I received a second one but it doesn't work as the previous one. I wrote again complaining because the item doesn't work properly and asking for a refund, but nobody never answered again. Actually, after few months, neither works, I can't turn on, even attached to the battery charger (not included). If I was allowed to rate minus 5 stars, I would. I have not received my order, and there is nobody that can help me. There is not one response to my message from Celetial (Muzo), and Indiegogo says there is nothing they can do about it. Everyone should be also careful not to invest money on a such platform (like Indiegogo). When something goes wrong, there is no one can help you. Your money is simply just gone. I bought two units. Only received one. This does not work. It is just a white noise generator that does not fulfill its promises. I am trying to get a refund but am not getting any answer. I heard a class action is under discussion. I will try to join. After I waited for more than a year, I finally got the device. I followed all the steps and found out the noise cancellation has no effects at all. A very big disappointment. After over a year waiting to get my Muzo, it finally arrived, but there are a lot of issues. First and foremost, the noise canceling is a total SCAM! This just produces noise. Then the phone connection does not work at all! It is amazing that companies like Kickstarter and Indiegogo push this kind of product on their platform. I got two devices from the promotional Kickstarter campaign. Both can charge the battery, connect to the phone, but lack the promised function: noise cancellation. It produces a humming noise when the silent mode is activated, but all background noises don't disappear. I hope somebody will take them to court for this scam. I will file a request for a refund. How do you file a request for a refund? I also, like many other people, ordered the Muzo from Italy a year and a half ago, and I have not yet received it. I knew that the Celestial Tribe has an office in Hong Kong, but here it's written that the society is a resident of San Francisco. I was a law teacher, and I think we can start an action to make us return the money we spent. We can try to start legal action collectively, even if we come from different countries. If you want, you can contact me on Facebook (look me on my account, Miclos von Weilshot). Sorry for my not so good English. Ciao Miclos, great idea. I sent you a message on Facebook. Yesterday I received only one of the two ordered Muzos after fifteen months. I had chosen to soundproof my house, but rather than suppress the noise, this device does nothing but reproduces audio tracks of natural effects. It's not at all what I asked for when they first introduced it a year ago. And then why was only one piece sent and not two? Since I have thrown away some money to have two useless devices at least send them both. A useless but very expensive device! 1. This is just a glorified noise machine and does not cancel out any noise. 2. My brand new machine will not charge and did not charge the moment I took it out of the box. 3. I have emailed customer service, and I am still waiting for an answer. 4. I would expect much better for the amount of money we paid for this device. Nothing to add. Money wasted. It just adds a sound and increase the noise level. Furthermore, I had to pay 30€ ($36.20) for a customs fee. So, this is the worst purchase I ever made. To be recommended to your enemies only. I have ordered in June 2016 and with all their promises that they will ship soon still nothing. They are a total scam, and I do wish for them to never have any success in anything ever, as they are fooling people and breaking the trust on Kickstarter. All I can say is that it's a disgrace to all the team. The worst product on Kickstarter, and since then I stopped using Kickstarter. Don't use Kickstarter. Write a Review for Muzo!